Here is my Schrodingers’ cat tattoo that I got last December. 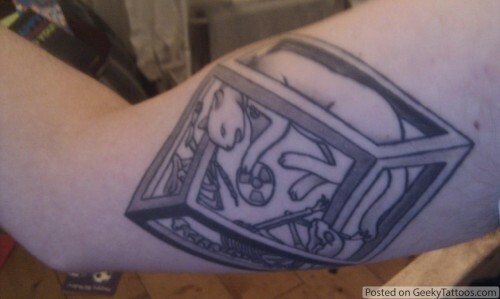 It shows an alive cat, the skeleton of a cat and the Radiation warning symbol all contained in an Escher box. I am a medical physicisist and work with Ionising radiation most days. I got the tattoo as I love Physics and especially the Philosophy of Physics, and think this shows the concept of uncertainty extremely well. The artist, Richie Clarke @ Forever True in Liverpool, UK did a great job! Tagged with Forever True, philosophy, Richie Clarke, Schrodingers' Cat. That is a brilliant piece of artwork, and a great tattoo.